For four years Kepler space telescope continuously observed a single patch on the sky looking for the tiny, periodic fluctuations in brightness of more than 150000 stars, caused by planets transiting in front of them. In May 2013 the second gyro-wheel failed putting an end to the Kepler's primary mission, and many thought that was the end for the spacecraft too. Nothing further from the truth! The scientists and engineers did not want to give up on otherwise functional space telescope. An alternative mission was designed, where the spacecraft will observe several fields along the ecliptic, with the help of the pressure from sunlight to control the pointing together with the remaining control wheels. The new mission, dubbed K2, promised to continue Kepler's search for exoplanets, as well as enable observations of stellar clusters, active galaxies and supernovae. Kepler has kept its promise! An international team of astronomers from the US, Italy, Switzerland, UK, Canada and Portugal, lead by Andrew Vanderburg of the Harvard-Smithsonian Center for Astrophysics (CfA) found a new super-Earth using the data collected during Kepler's 9-day test observations in February 2014. "We needed an authoritative confirmation of this result, like those HARPS-N gives", contentedly says Emilio Molinari, the director of Telescopio Nazionale Galileo (TNG) in La Palma, Canary Islands, where the High Accuracy Radial Velocity Planet Searcher – North (HARPS-N) is mounted. "The very precise radial velocity measurements from HARPS-N would confirm there is actually the planet, as well as provide valuable information on its characteristics like mass and density", adds Molinari. The team obtained the radial velocities of HIP 116454 planetary system from the HARPS-N observations that were carried out during the months of July to September 2014. The newfound planet, HIP 116454b, has a diameter of 32200 km, two and a half times the size of Earth. HARPS-N showed that it weighs almost 12 times as much as Earth. This makes HIP 116454b a super-Earth, a class of planets that doesn't exist in our solar system. The average density suggests that this planet is either a water world (composed of about three-fourths water and one-fourth rock) or a mini-Neptune with an extended, gaseous atmosphere. The astronomers predict its temperature to be around 400 degrees Celsius. HIP 116454b has an orbital period of 9.1 days and therefore it orbits at a close distance of about 13.5 million km from its host star, 11 times closer than the Earth is to the Sun. The host star, HIP 116454, is an orange dwarf, slightly smaller and cooler than our sun, in the constellation of Pisces around 180 light- years away from us. 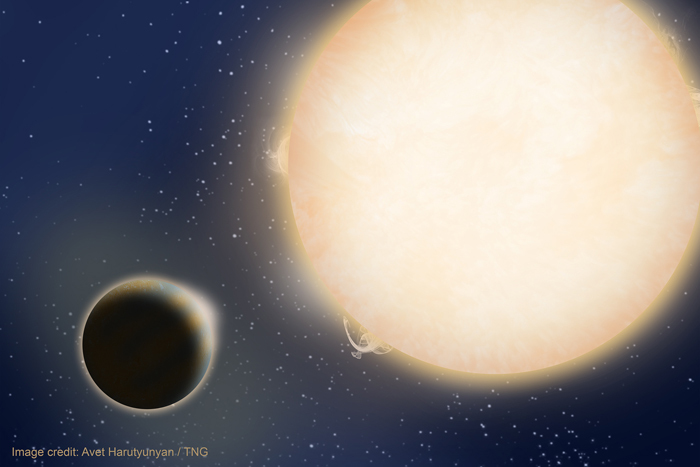 "HARPS-N has already discovered and characterized several tens of extrasolar planets. But we are especially happy for HIP 116454b, as it is the first planet from the Kepler's new life," says Giampoalo Piotto, astronomer at Padua University and co-author of the paper.